X-it Games is a small venue in a town that I’d never heard of before it got an escape room. With a population of just 15,000, this isn’t a place that you’d expect to have a game, but it’s part of the growing Yorkshire market, and being within easy striking distance of Leeds probably means there are more potential players than you might first imagine. And, in the end, build it and they will come. First impressions were good: there’s a well presented waiting area which looks out onto the street (indeed, during our visit someone wandering by popped in to find out more), and the owner was enthusiastic and knowledgeable. So far so good, but what would the room be like? 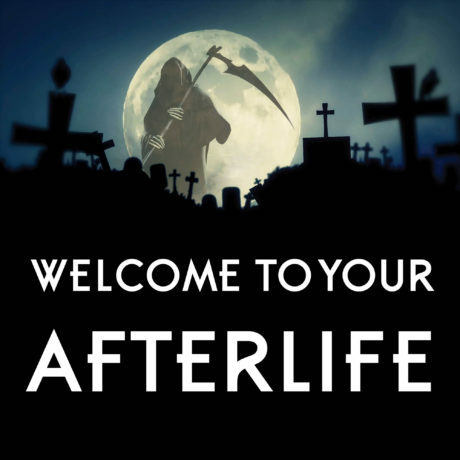 Once you’ve entered the game, Afterlife kicks things off with an audio introduction. There’s limited light during the opening, so it was easy to focus on what we were being told and, to be honest, there wasn’t much to look around at anyway. Worry not, though – neither the low lighting nor the minimalist decoration would last for long. In fact, this is a game with stunning set design in a variety of styles. As we moved through the room, I was surprised by what I saw each time we entered a new part of the experience. The attention to detail was impressive. It wasn’t just that the set was pretty, though: it was laid out in an interesting way. Don’t expect to wander through doorways to reach new spaces. This is a game set in the afterlife and, to make that work, they can’t go with conventional rooms. That varied theming gave each space its own character, which helped to underline the mission aspect of the game. It didn’t have an evolving story, but it certainly took you on a journey which, for me, is just as good. Unsurprisingly, the puzzles weren’t as strong as the decoration, although there were still some very positive moments to be had. There’s a variety to the challenges, with an audio-based puzzle coming early in the room being a good example of how you can level the playing field for new and experienced escapers. I loved the structure of a set of puzzles at the heart of the experience which came together in a cool way that could easily just have been a combination lock but instead had a cool input mechanism that fitted with the game. While we generally got through the puzzles without trouble, I saw a few places where I think some teams will experience frustration. If either search or riddles are things you don’t get on with, then be warned that you’ll experience an above-average amount here. Late in the game, there’s a physical challenge that you may love or loathe depending on your temperament, skill level and how much time you have left. I’ve seen similar challenges several times before, but this one was right at the upper end of the difficulty level, with us failing a couple of times before finally getting past it and still feeling we’d been a little lucky. There’s also a slightly tricksy challenge around that time which we got past relatively easily but may be frustrating for some players. The finale to the game is both amazing and slightly disappointing. Visually it’s another stunning room with a very minimalist yet opulent feel to it which is perfect for the theme. The two puzzles highlighted above both serve to make the game more fun but also to bottleneck it slightly for larger teams, with one effectively blocking out the rest of the team and the other realistically only allowing two players to take part. The ending, though, is spot on, with the mission being completed exactly how you would expect. Our team of two escaped in 53 minutes having taken four clues, mainly on search fails but once on a misinterpreted riddle. Those clues came over a screen in the main room. Afterlife is a thoroughly enjoyable adventure which combines good puzzles with a fun sense of exploration and stunning set design. While there were a couple of sticking points in the game, this is still a room that I would absolutely recommend if you’re even vaguely nearby. We played as a two, which was great fun, but the minimum on their website is three and for good reason – there’s a lot to get through in an hour. A team of three or even four would be fine, but be warned that there are cramped moments in the game, so I’d avoid filling the room where possible.